Cool, moist soil. Benefits from organic matter addition. Shady areas. Mixed beds or specimen plant. Easy. Water during dry spells. Plants may go dormant (foliage dies back) during hot, dry summers. A long lived, old fashioned favorite. 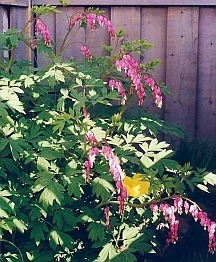 Bleeding Heart is an old-fashioned favorite that, once established, will last a lifetime. The 2 foot tall plants have attractive, finely cut foliage and beautiful stems of pink, heart shaped flowers. They begin flowering in the early spring and make a nice complement to spring flowering bulbs. Bleeding heart prefers a rich, moist soil and benefits from the addition of some good compost at planting time. It is quite common for the foliage to die back during the summer - particularly during extended warm spells or when the plants are placed in drier, sunnier locations. Marking the plant's location will help to prevent root damage from cultivation. Established plants can be divided in the spring for more stock. Set new plants about 2 feet apart.